Over the past couple of days or so, I have been busy listing various antique and vintage pieces up to several pages on KT Miniatures website, all now available to purchase. 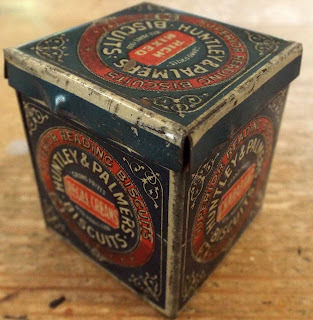 Ok...I know that this tin is large scale, measuring 1 1/2" wide and deep plus 1 3/4" high, but it would look fantastic in an antique dolls house kitchen, that is either large scale or where scale does not matter. 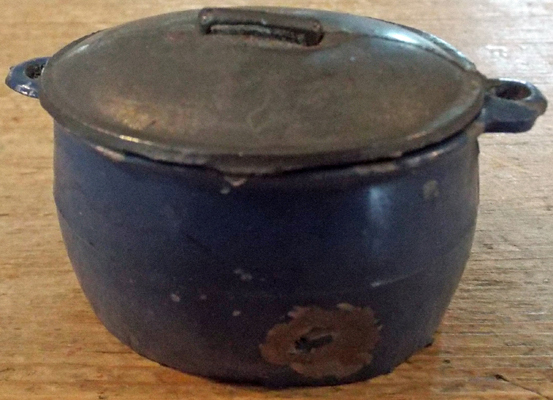 This is completely in original condition and the lid can lift off. I love it! Now this is a first for KT Miniatures....I have handled one or two other REKA items before but never a cooking pot with the original lid would you believe! These REKA pieces are becoming increasingly rare these days so it is nice to have one on offer today! The pot is a lovely shade of blue and the removable lid is metal colour. 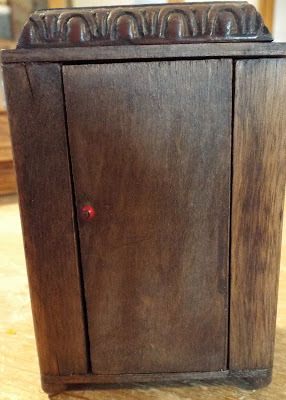 The name REKA is embossed underneath the pot. 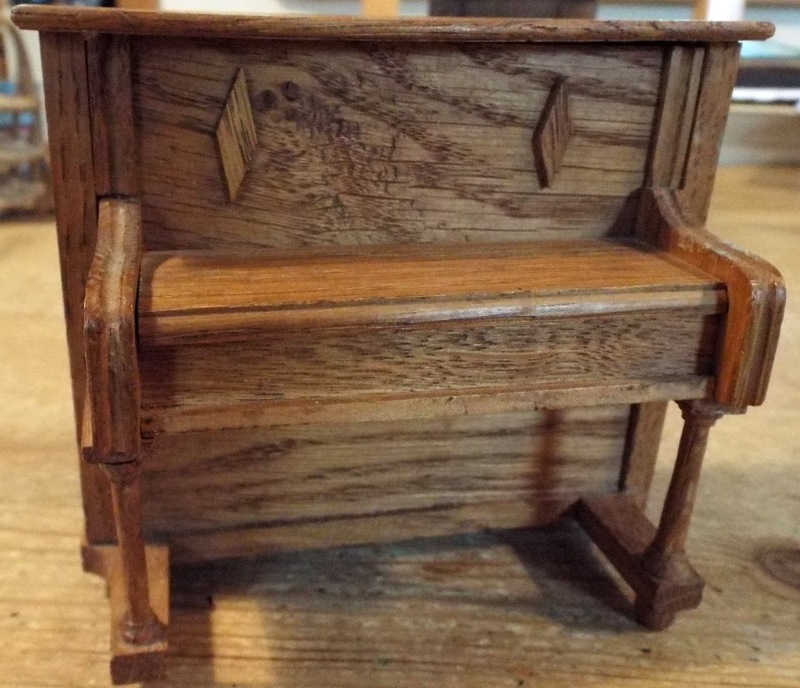 As with the sample tin above, this is also large scale measuring 1 1/2" high but would suit a larger dolls house kitchen or an old dolls house where scale doesn't matter. 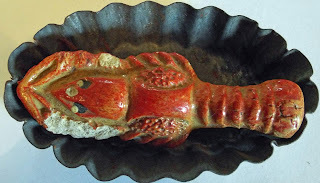 Ok, the old plaster lobster may have a few nibbles from his sides, but he is still rather lovely. 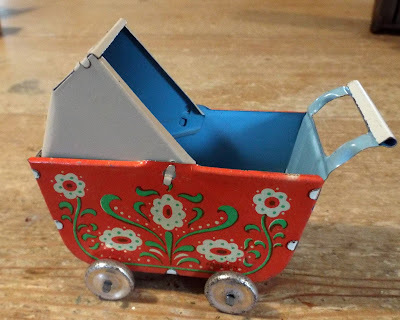 These plaster dolls house items are so fragile in young hands but this one has managed to survive being passed down through three entire generations of the same family of young ladies and he is still here to tell the tale! 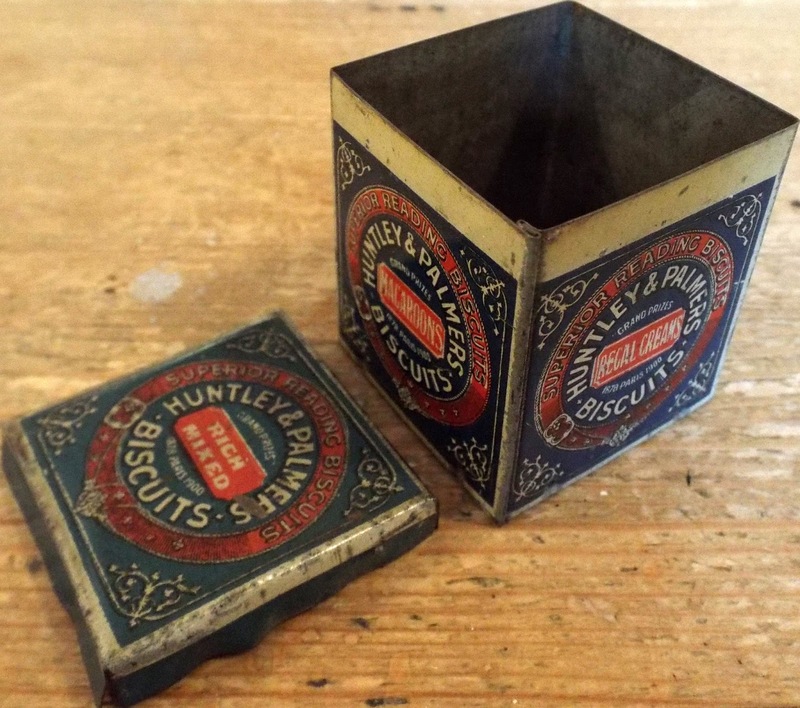 He came with the old fluted tin so am keeping them together. I love his eyes - he has such character! And the patina of the original colouring is just lovely. Mr Lobster measures just under 2" long...so quite big. These saucepans came with the same items as shown above. 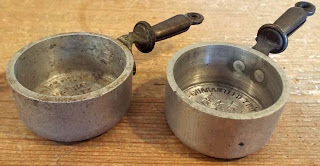 Underneath each pan it states MADE IN FRANCE. As you can see in this photo, embossed inside each base is the following: "GUARANTEED THICKNESS OF OUR PATENTED SERIES BOR. WEIGHT AT LEAST 42/5 lbs". 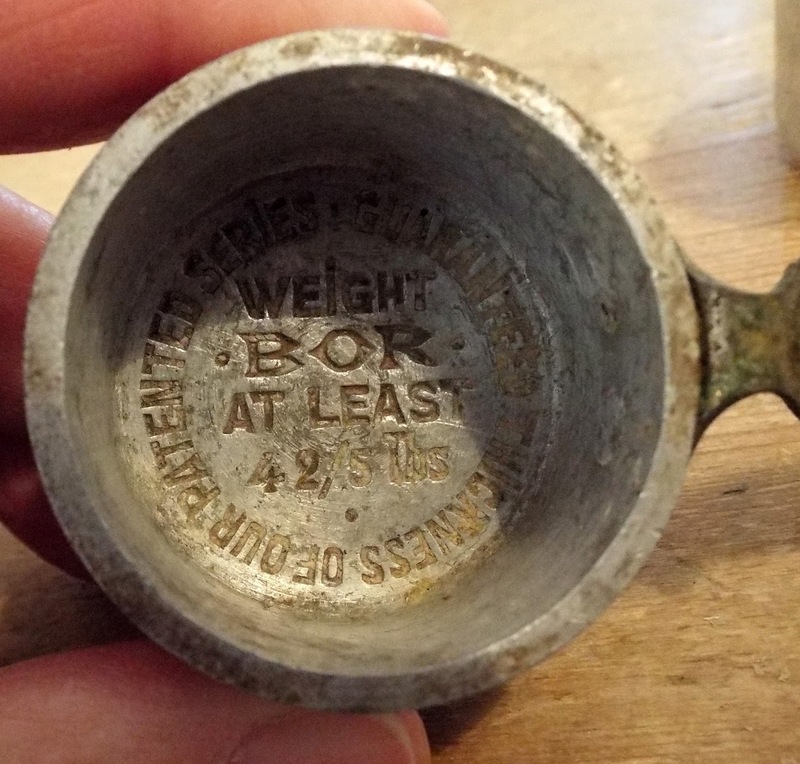 I am assuming that these French saucepans are possibly tradesmans samples, advertising the company BOR? 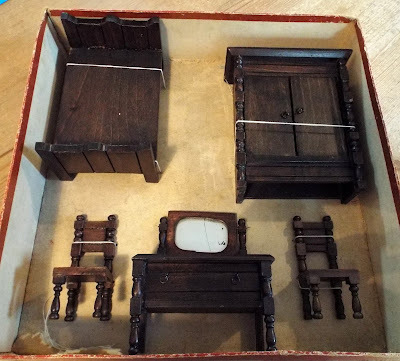 These are just a tiny selection of several old miniature treasures that have gone up for sale over the past 2 days. At the top of that page, you will find links to all the other rooms. I will continue to list further antique and vintage miniatures of different scales, as and when I can over the next few days. 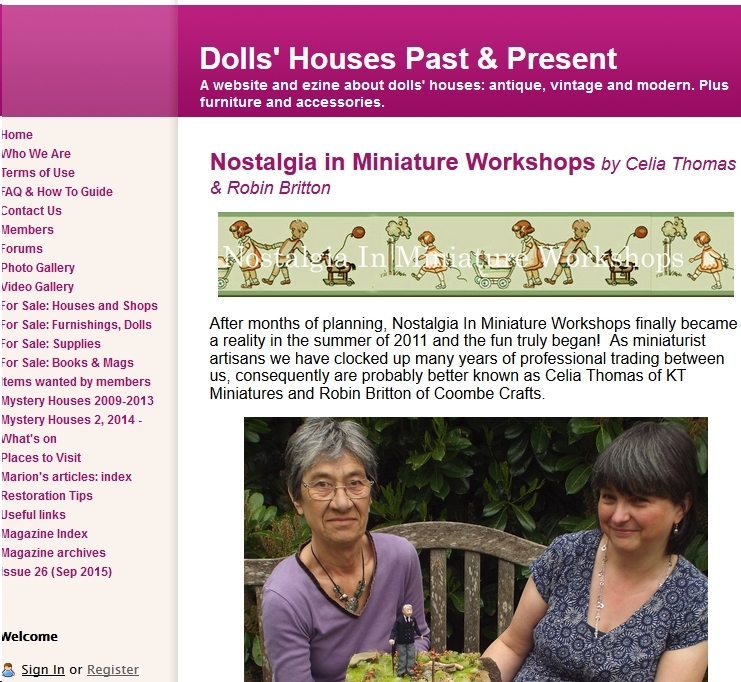 A Little Bit About Our Workshops On The Dolls Houses Past & Present Magazine September Issue! 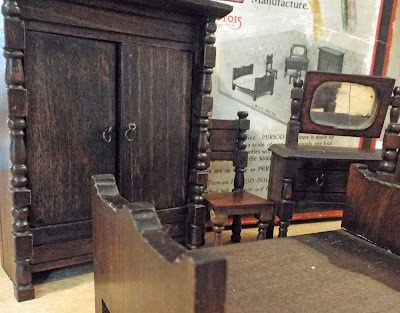 If you have never viewed The Dolls' Houses Past & Present website before but are very much into dolls houses...then I can highly recommend you taking a look. 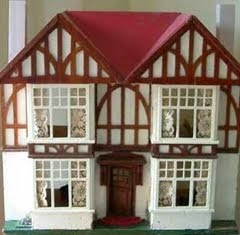 It is a website filled with information all about dolls houses, mainly antique and vintage but some more modern ones as well. 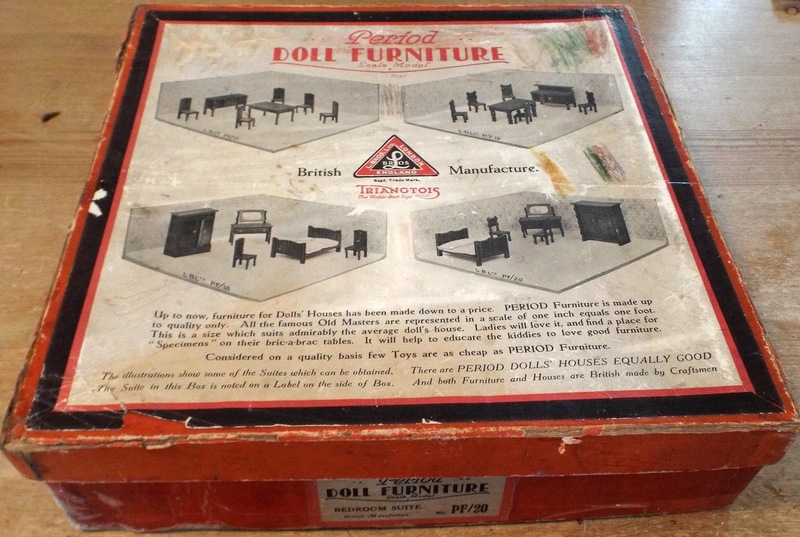 You will find pages and pages of amazing photos within the "Galleries", a "What's On" section, a lively "Forum" and various other sections too - all relating to dolls houses in some way. Plus there is a delightful online quarterly magazine edited by the extremely knowledgeable and inspirational owner of the website - Rebecca Green. 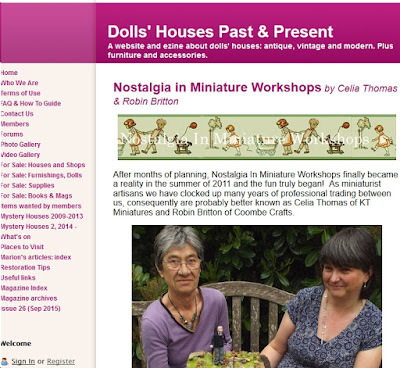 Labels: Dolls Houses Past & Present Website, Nostalgia In Miniature Workshop Magazine Feature. 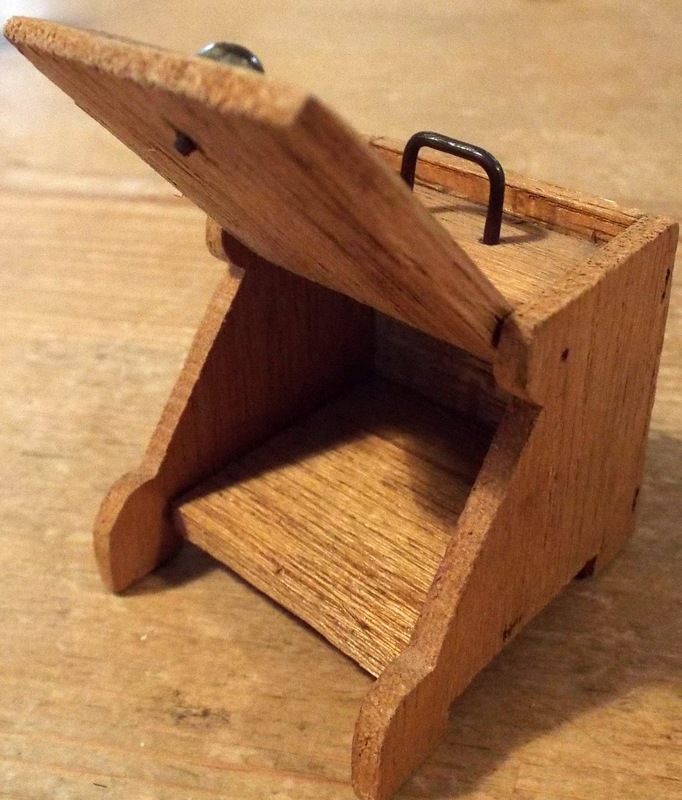 I have been doing some re-jiggling to KT Miniatures Little Handmade Emporium pages on the website and have now included a third page - Basement. I have moved all the handmade miniature scenes/gifts that are currently up for sale to the newly formed Basement page - should make it easier to view, now that those particular items are all together in one place. 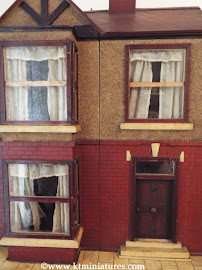 The Ground & Upper Floors are filled with all my usual 1/12th scale handmade miniatures. 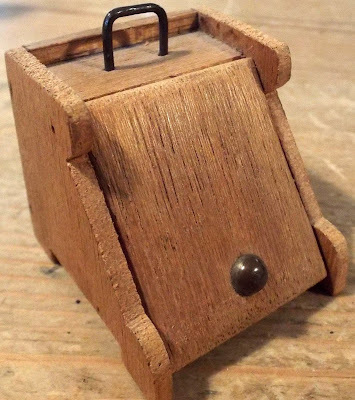 Above, you will find a promotional video for the "Story Time" miniature scene inside an old mantel clock, containing some antique and vintage dolls plus some of my handmade pieces, currently up for sale down on the Basement Page. 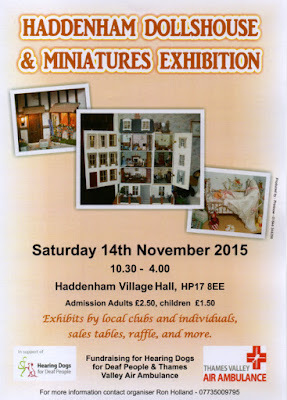 Miniature scenes make ideal gifts, particularly with Xmas coming up...? The video has been fun to make...hope you like it! Labels: Basement Page, KT Miniatures Little Handmade Emporium, Story Time Miniature Scene Inside An Old Clock. 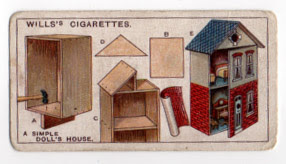 How To Make A Simple Dolls House - From Instructions Off An Old Cigarette Card! 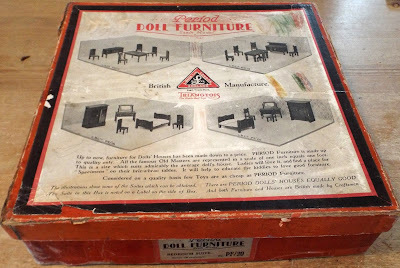 Look what I found tucked away amongst a collection of old dolls house postcards that I'd bought several years ago off the Thame Dolls House & Miniatures Fair charity stand, and which I had long put away in a drawer and forgotten about. I was gobsmacked as I must have originally missed this amongst all the postcards all those years ago and it has been sitting in my drawer undiscovered all this time, but there again it is so tiny!!! Basically this is a cigarette card measuring just 2 5/8" x 1 3/8" produced by Wills's Cigarettes - probably around the 1930s. It states that this is card No. 13 of a set of 50 and is part of a 2nd Series of Household Hints. This card may be tiny but how fantastic is this....it gives us a complete set of instructions including illustrations on how to make A SIMPLE DOLLS HOUSE. On the back of the card are these instructions - you may have to click on the image to enlarge it a little more in the hope that you will be able to read the writing. I love the bit at the end where it proclaims that "Cigarette cards make admirable pictures for the walls." Absolutely they do!!! 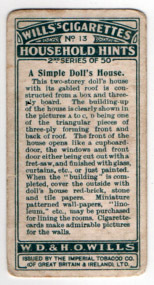 Labels: 1930s Wills's Cigarettes Household Hints, 2nd Series Of 50, A Simple Dolls House. Some Lovely Antique & Vintage Items Have Gone Up For Sale At Last! 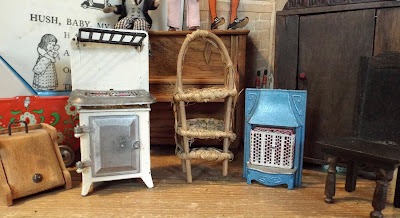 Finally I was actually able to list some wonderful antique and vintage treasures to KT Miniatures website yesterday....after weeks and weeks away from my desk! (Many thanks for your messages re: Mr KT - he is back home again, rather poorly but still smiling). Even though one or two of the old treasures were snapped up immediately, there are still plenty of others on offer. This rare c1923-1925 Elgin Boxed Bedroom - PF20 Jacobean Bedroom Suite Boxed (Sold Under Lines Bros. Ltd/Tri-ang Label) was snapped up very quickly. Not surprising as these just don't come along very often. 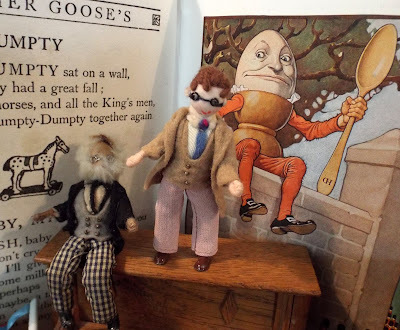 This teenage Grecon doll who is causing a bit of a riot with old Grandpa Grecon on top of the old piano, has Humpty Dumpty watching them very closely...ha ha! These two Grecon dolls are now up for sale on the Old Dolls House Dolls Page. A variety of other miniature furniture and accessories were also listed yesterday. The piano caused a large amount of interest and was reserved almost immediately. Not surprising, as it is exquisite. 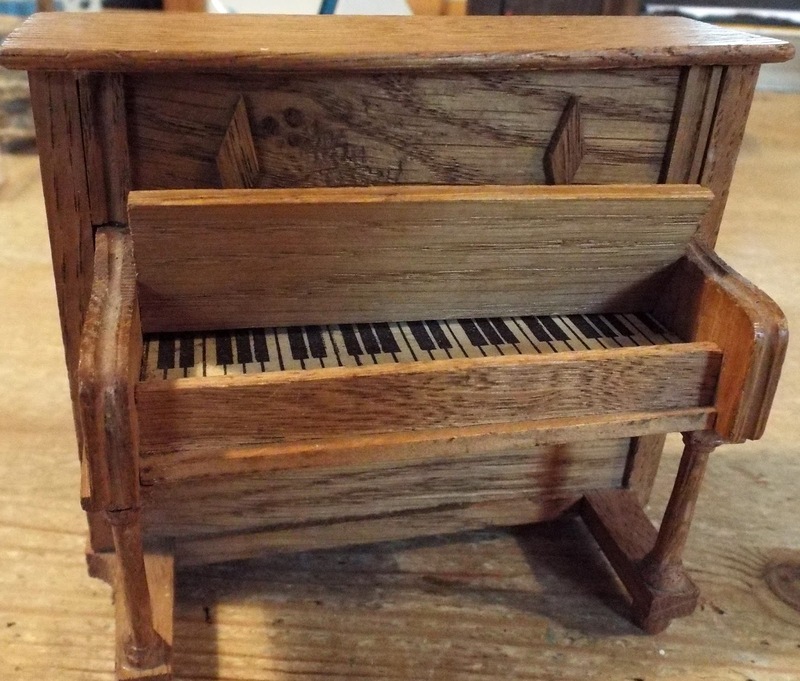 It is of wooden construction, with a lift up lid that reveals original paper keys. 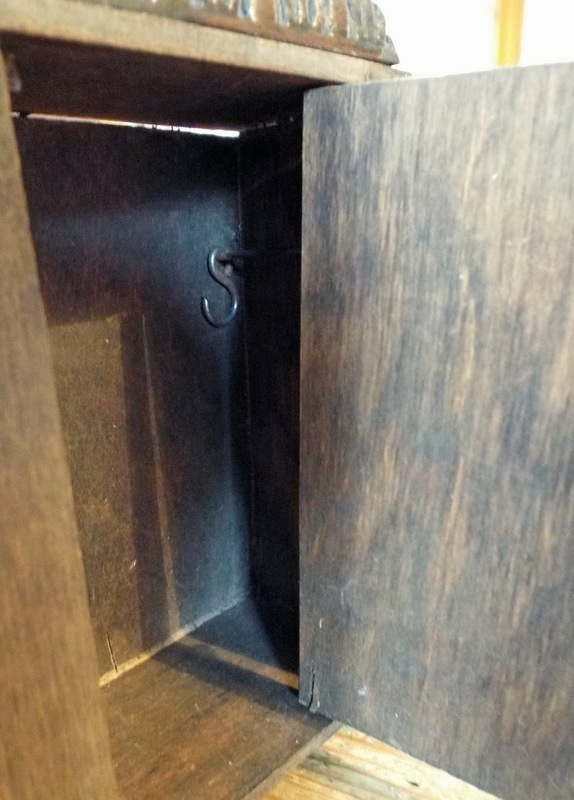 There are two rather lovely wooden diamond shaped embellishments on the main part of the piano, above the keys. So too, the shaped legs give extra character. I think this could well be of German origin. There is is a price of 1/- (one shilling) on the back in pencil, which was a lot of money back in 1926!! How do I know this dates from 1926? Well - just take a look at the photo below. 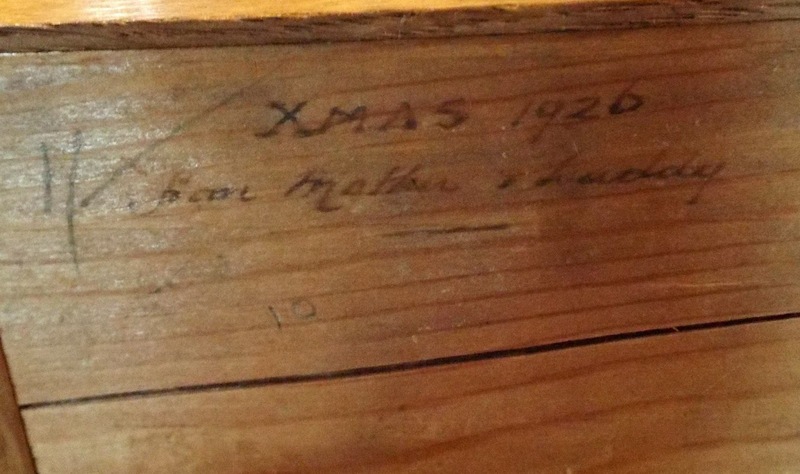 As well as the price, there is this wonderful inscription on the back which you can see above.... makes it so very easy to date..if only every piece of dolls house furniture had a dated inscription!! 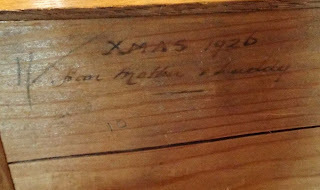 Must admit, I was curious as to why the inscription said " Mother & Daddy" and not "Mummy & Daddy". "Mother" sounds so formal...don't you think? Now this tin floral pram is curious. It is marked FOREIGN and I have come across these a few times over the years. I had always assumed (along with a lot of other people) that these dated from the 1930s and were of German origin. 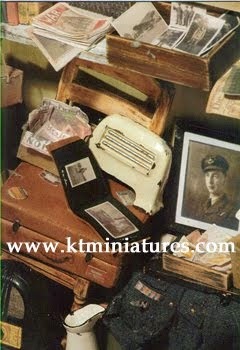 But just recently these have appeared advertised on a well known website as being Hungarian and dated from the 1950s. So...the jury is out on this one? 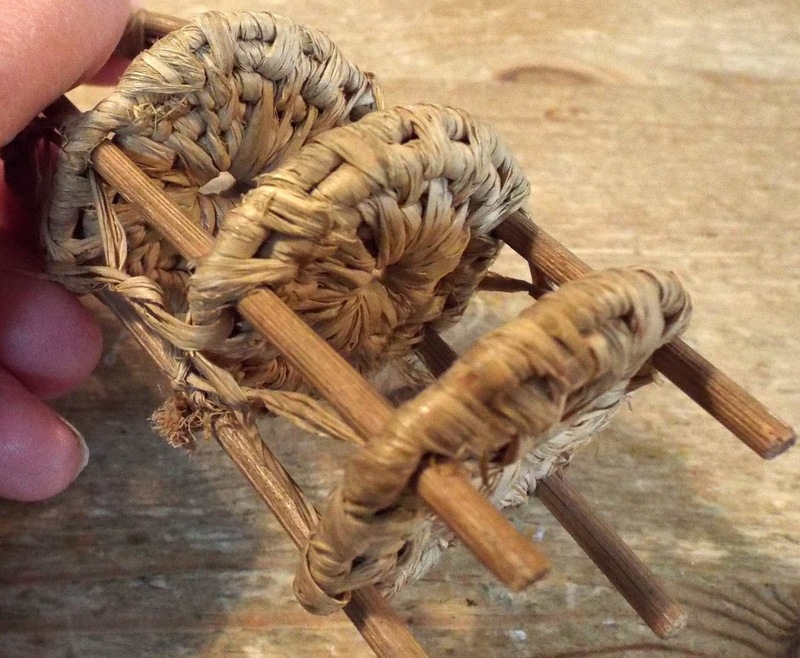 This is currently up for sale on the Antique Nursery Page. This vintage raffia and cane three tiered cake stand intrigues me. Do you think this is maybe Japanese and date from pre WW2? Has anyone seen one quite like this before-I certainly haven't? It would look fabulous laden with vintage plates of food. 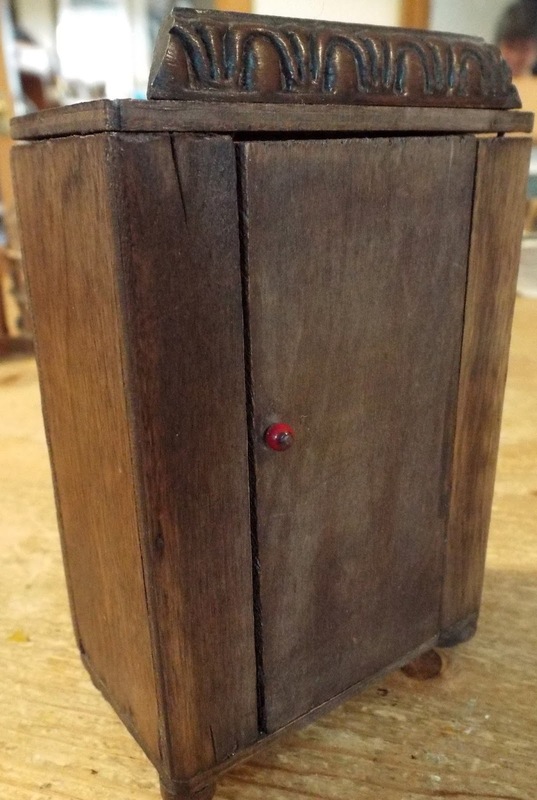 Then there is this vintage wooden coal scuttle....the lid lifts up. It has been well made but no idea of exact date or origin. Am possibly wondering if it has been homemade from some sort of commercial plans? 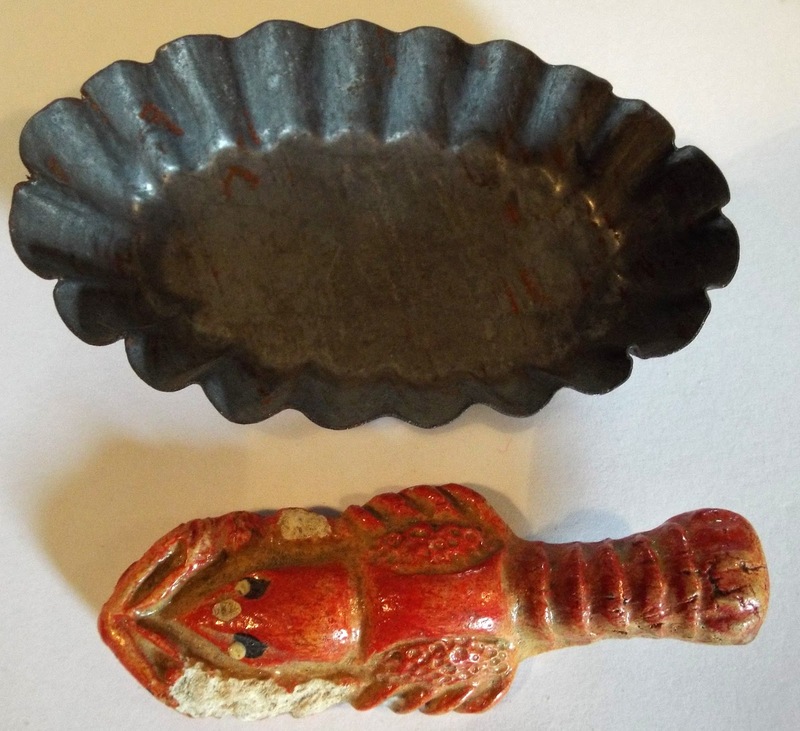 The cake stand and coal scuttle can be found with other items for sale on the Antique & Vintage Living/Dining Room Page. 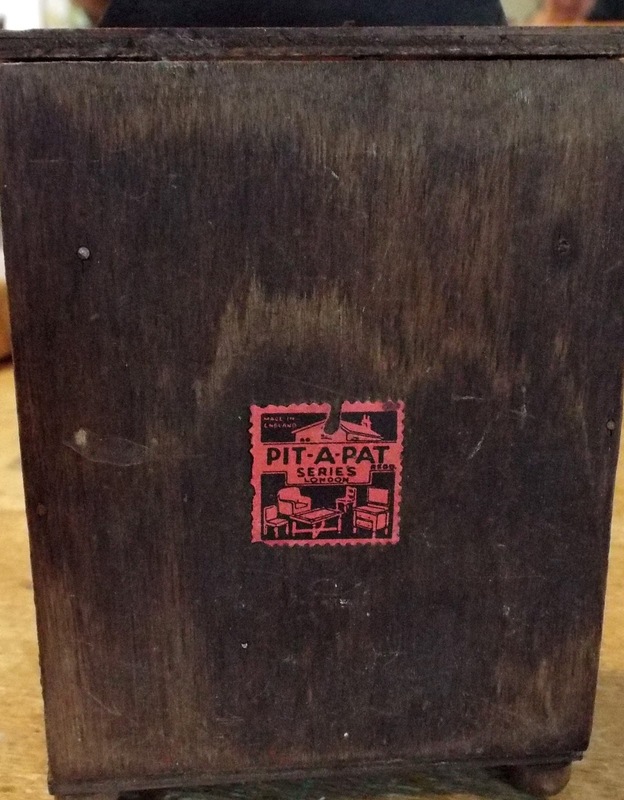 This c1930s Pit-a-Pat wardrobe has been put up for sale on the Pit-a-Pat Page. The door opens to reveal to hanging bars, one either side of the recess - complete with a suspended hanging hook on each side. The tiny red bead handle is original and on the back is the instantly recognsiable red and black paper Pit-a-Pat label. What is intriguing is that the beading along the top, commonly seen on Pit-a-Pat furniture and indeed their wardrobes, appears to be a little shorter than usual. Normally it spreads right across the top, but in this instance is stops short either side? Did the person making this run short of beading in the factory that day? 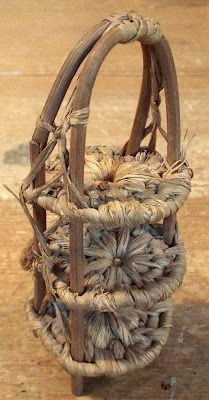 Or, perhaps was the original piece of beading lost and a previous owner fitted a replacement from another broken piece of Pit-a-Pat furniture? Am hoping to undertake some more vintage listing to the website next week. Is so good to be back working on KT Miniatures again! 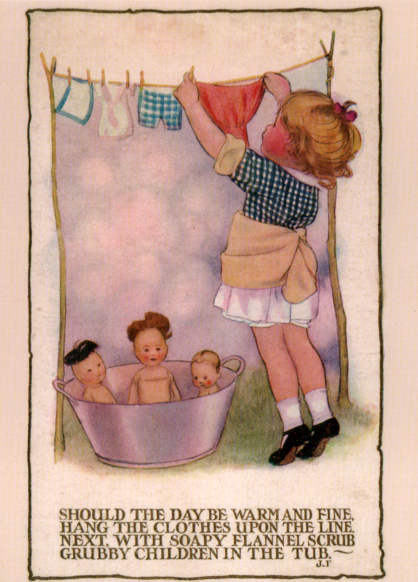 Someone recently sent me this gorgeous card and it just made me smile, so it is now stuck to my fridge door and continues to make me smile...so I thought I would share it with you! After the past few utterly weird and surreal weeks we have had here, life is now beginning to settle down into some sort of new routine at last....(I am saying this in a hushed voice and with all fingers and toes crossed, as I don't want to tempt providence too much)!!!! But Mr KT Miniatures is doing ok considering and even though reality now consists of constant trips to hospitals and all sorts of various medical professionals, he is being well looked after, so I can now breath a gentle sigh of relief and turn my attention back to KT Miniatures once more. I do have some rather lovely vintage pieces that I am hoping to put up for sale on the website this week - when they are listed I will add some information to my moving strapline on the right hand side of my HOME PAGE. 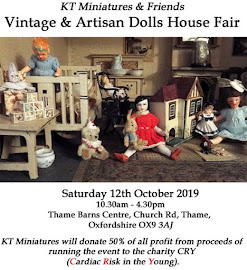 Not only will KT Miniatures' stand be filled with my handmade and vintage goodies at this delightful little event, but we are also able to have a stand for our Nostalgia In Miniature Workshops too, which is rather nice. So we are aiming to display a few of our past projects, as well as have one or two of our past workshop prototypes for sale, as both Robin (my workshop colleague) and myself are seriously running out of storage space! 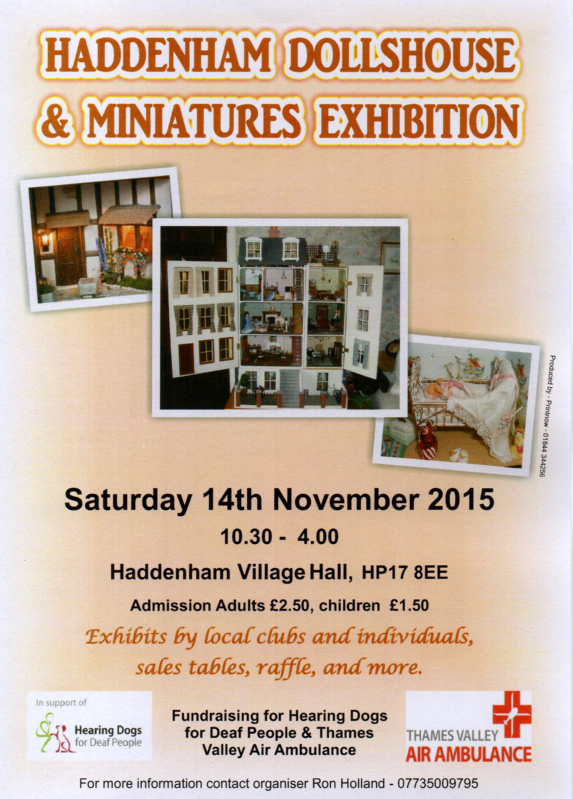 This Haddenham event has always been held biennially up until now but the new organisers have agreed to take this wonderful event over from the previous organisers - Freda and George Dorrel, who after many years have decided to retire from fair organising. Here is a flyer for the event, which gives you an idea of what it's all about. Haddenham is just less than 2 miles from Thame, close to Junctions 6 & 8 of the M40, has its own mainline station (Haddenham & Thame Parkway on the Chiltern Line) with direct routes from Birmingham and London Marylebone. There is a taxi rank at the station , and the "280" Arriva Bus stops outside the station every 20 mins which stops near the Village Hall. Or if you are feeling particularly energetic it would probably take you about 15-20 mins to walk from the station (with the wind behind you)!! My apologies if I am not able to respond to your emails or phone messages left on my answer phone quite so promptly as usual, but I will reply to you as soon as I can. Thank you for your continued patience.